Dating back at least 10,000 years, the intricate cave paintings found in a cave in India depict humans, animals, and everyday life in 8,000 BCE, but also kangaroos and giraffes not native to India. However, the most stunning parts of the cave paintings are the mysterious Alien Creatures and UFO’s which according to many, are evidence of Ancient Alien contact. Several rock paintings found in the Chhattisgarh cave in India have given rise to countless conspiracy theories related to Aliens. 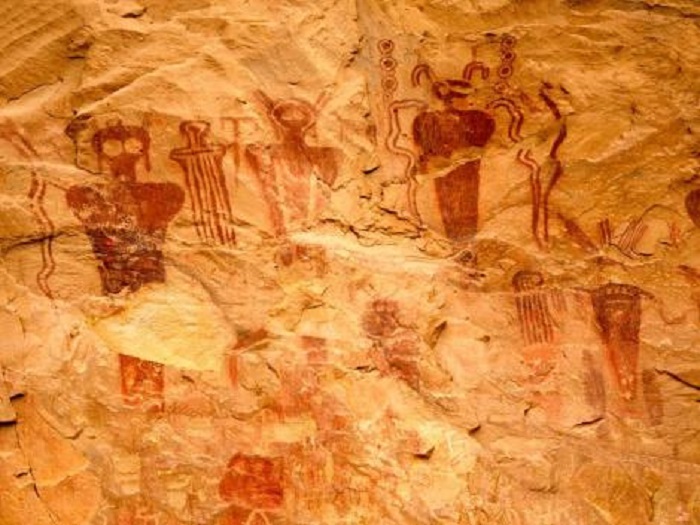 While many remain unconvinced that these ancient paintings are evidence of alien contact, locals people, and even researchers say it’s very possible. The paintings show scenes that are believed to have been painted more than 10,000 years ago, in which several strange beings—and UFO like objects—appear to come down from the sky. The cave paintings feature several „spheres“ which scientists have not been able to identify. The cave paintings are out of this world. 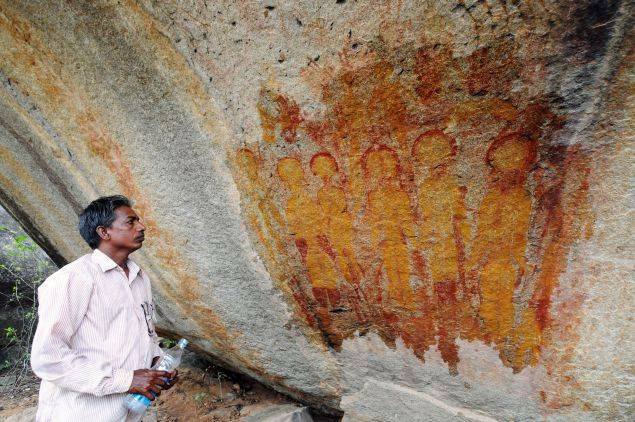 The archeology department in the area is believed to have asked the ISRO space agency for help in determining the strange nature of the paintings. Could this be the ultimate evidence that supports the Ancient Astronaut theory that presupposes intelligent extraterrestrial beings visited Earth and made contact with humans in antiquity and prehistoric times? According to comments made by JR Bhagat, there is no question that these paintings depict anything other than extraterrestrials. Archaeologists believe its evidence of a forbidden history that has survived only because it was written in stone. In addition to the award creatures and disc-shaped objects, many of the paintings are the usual drawings of humans, animals and everyday life in 8,000 BCE. But it also stunned many because some depict kangaroos and giraffes (not native to India at all) and fish-like-creatures. “The findings suggest that humans in prehistoric times may have seen or imagined beings from other planets which still create curiosity among people and researchers. Extensive research is needed for further findings. Chhattisgarh presently doesn’t have any such expert who could give clarity on the subject. The paintings are done in natural colors that have hardly faded despite the years. The strangely carved figures are seen holding weapon-like objects and do not have clear features. The nose and mouth are missing, and in a few pictures they are even shown wearing spacesuits. We can’t refuse the possibility of imagination by prehistoric men, but humans usually fancy such things,” said archeologists JR Bhagat. The times of India doesn’t seem to give in to the conspiracy theory and is convinced—as many other readers—that we have actual, conclusive evidence of alien contact in ancient times. But what makes this story even more fascinating perhaps, is the fact that similar ancient cave paintings have been found all over the globe. It’s as if ancient cultures around the world saw on a global scale something in the sky, and possibly even among them, that they had to write down in stone, hoping that their story would be deciphered one day. 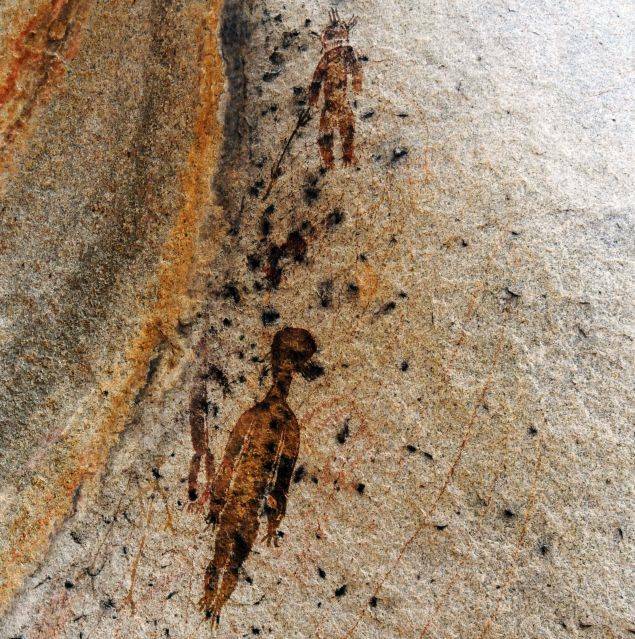 This is a cave painting found in Kimberley, Australia. 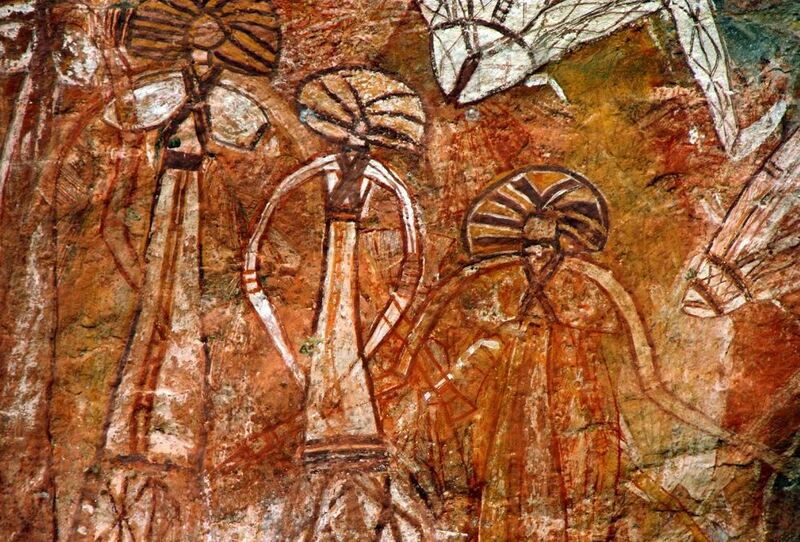 They were painted by the native Aborigines approximately 5,000 years ago. These are some of the ancient petroglyphs discovered in Utah, in the Barrier Canyon. Just as many other cave paintings, these too depict a number of tall beings with similarly shaped heads as to the ones found in Australia, and other parts of the world.